▶▶Commodity Description: Material: high-density wear-resistant water-repellent nylon fabric, high-quality two-layer leather accessories, high-quality hardware accessories; Usage: portable, shoulder; External structure: 2 front zip pockets, 1 rear zip pocket, 2 side pockets; Internal structure: 1 main bag, 1 zip pocket; Dimensions: 31cm x 13cm x 21cm (manual measurement, small errors in size); ▶▶ Features: · This portable cross-body tote bag has a large capacity and a rich design of storage bag. All the bags are included in the umbrella, kettle, IPAD, mobile phone, wallet, magazine, documents and keys. 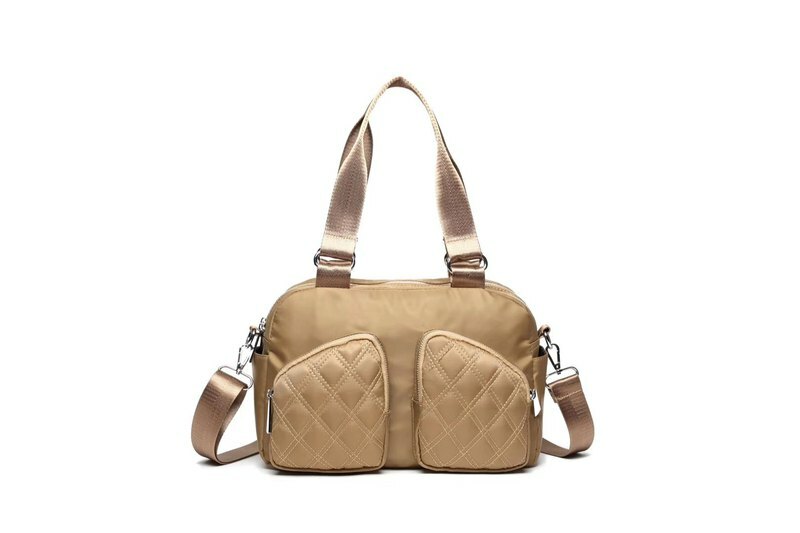 ·The bag is made of high-density wear-resistant and water-repellent fabric, which has better anti-pollution effect and more durable; ·The high-quality two-layer cowhide fabric is added to the hand-held parts, and the touch is better without scratching hands; ·The shoulder strap can be adjusted, and the length can be as desired; [Product Precautions] The photo will be set to the same size as each screen label. The products are subject to the actual product. If you have any inconvenience, please forgive me!